Award winning cuisine coupled with a breathtaking view is served up every day in the casual atmosphere of the Hideaway CafÃ©. The only thing we overlook is the ocean!! Tucked away on the sleepy island of Grassy Key is a gourmand's treasure. In operation for more than 10 years at Rainbow Bend Resort, the Hideaway Cafe has always maintained a reputation for excellence in serving top-notch cuisine and is one of the few places that local residents can feel they are truly "getting away from it all." With an ocean view to match its delicious food, it is indeed a rare treat and a unique dining experience at this pleasant gem of a restaurant, whether it's for morning breakfast or a full-blown Continental dinner. 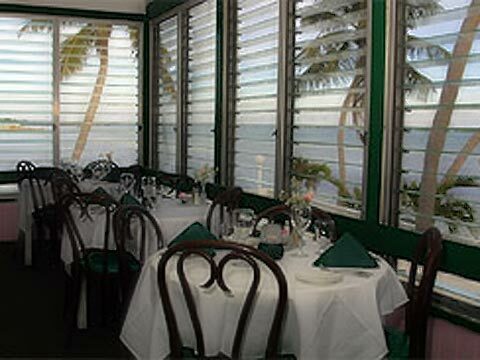 Over the years, we have watched this best-kept secret in the Keys blossom into one of the most sought-after places for a romantic dinner with that special someone. A place that offers an extensive choice or great food and fine wines, personalized service and attention to detail. One is struck by the intimacy of this true "hideaway". The staff greet its guests like they are already part of the family. While the chef creates delicious magic, like any artist constantly experimenting with new combinations of ingredients, keeping only the best. While you peruse the menu, the friendly waitstaff will bring you a plate of warm French bread. For starters, I highly recommend one of the escargot selections or French Onion soup, washed down with an excellent glass of wine. There is a wine list of a first-class caliber, so you are sure to find one to your liking. Escargot a la Edison appeals to the sight as well as to the taste. Cognac-flameo escargot are complimented with red, green, and white julienne vegetables, cooked al dente and arranged in a delicate pool of light cream sauce flavored with garlic and pepper. The variety and scope of this menu is truly amazing: Lobster & Seafood, Crepes, Roasted Whole Duck, Blackened Shrimp and fresh local seafood, just to name a few. There is a selection here to please everyone from the traditional Rack of Lamb, Grouper Francaise and Filet Medallions to something from a different continent such as Seafood Crepes and Shrimp Scampi. The menu ranges from soups, appetizers, seafood, aged beef and pasta plus the daily special. The chef creates a vegetable of the day such as Broccoli with Hollandaise sauce or Green Beans Marinara. The Hideaway's beef selections include the chef's special Rib Steak at almost 2lbs , one of the best Filet Mignons I've ever tasted, and Medallions of Beef. The Hideaways entrees may be sauteed in wine and flavored with fresh herbs or stuffed with tomatoes, mushrooms, spinach, or prosciutto. There is a dessert selection featuring a variety that would do a much larger, sophisticated restaurant proud. I highly recommend the chef's Banana's Foster. The chef is a genius at combining flavors which complement and enhance each other, and has mastered the art of orchestrating great meals. Seating is in a cozy, mirrored, glass-enclosed and air-conditioned dining room, or if you wish you can do without air-conditioning, on a jalousie-window enclosed balcony that opens onto soft ocean breezes, while overlooking the pool, beach and ocean. Everything compliments the dark wooden wine racks that line the patina colored walls framed by Caribbean-style floor to ceiling shutters. Candles cast a romantic glow over each linen clothed table, a setting fit for lovers. The cafe is small, seating is limited and management wants to keep it that way. Hideaway Cafe certainly does know how to put together flavors. If a customer wants something that is not on the menu, they will happily fix it if the ingredients are available. Hideaway Cafe is located at Rainbow Bend Resort on Grassy Key, Mile Marker 58, oceanside. Look for the big rainbow-style sign, on the oceanside.